Thus it begins; with an innocuous “and introducing” credit in MY FRIEND IRMA – the comet-across-the-skies film career of the comedy team known as Martin & Lewis. In this goofy female-driven comedy, Irma (Marie Wilson) is the well-meaning but airheaded roommate of grounded Jane (Diana Lynn). Irma’s boyfriend is grifter Al (John Lund), always looking for a way to make a quick buck. 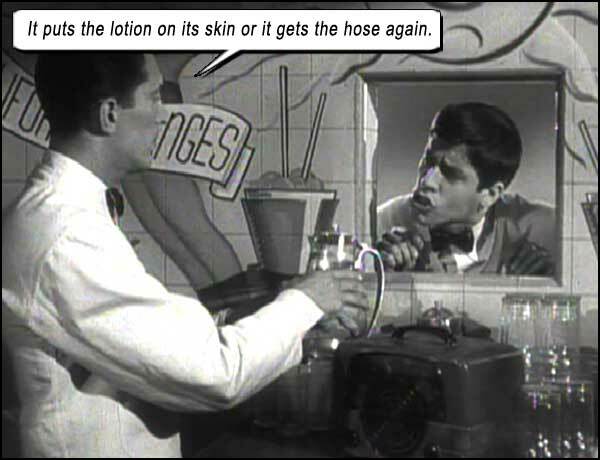 Al finds his means in crooner Steve (Dean Martin), who works at a juice bar with his high-pitched, high-strung pal Seymour (Jerry Lewis), offering to manage Steve on the nightclub circuit. The tale is told from the point of view of Jane, the plot revolving around Jane trying to land a job as secretary to a millionaire (Don DeFore) in order to seduce him, marry him and live the life of Melania. In other words, she’s a gold-digger. It’s 1949, and that’s the highest aspiration a woman could have: marrying into money. But Jane falls for penniless Steve because, apparently, chicks dig rock stars. Who knew? MY FRIEND IRMA is an awkward movie. Directed by veteran George Marshall, written by Cy Howard and Parke Levy, it lacks a cogent direction, as it is trying to tell the tale of the females, while shoehorning in Martin and Lewis. 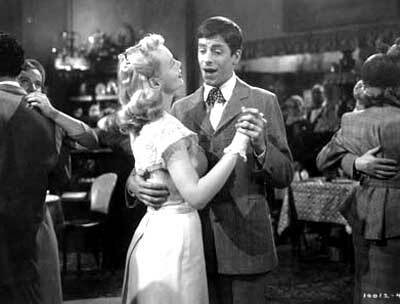 It’s a comedy-musical, with Marie Wilson as Irma doing a female version of the goofy klutz (that Jerry Lewis would perfect in a much more studied manner in upcoming years), and John Lund as her scheming boyfriend Al, a completely unnecessary widget to the story. It’s strange to think that Jerry first auditioned for the part of the creepy, unprincipled Al (and failed to impress the filmmakers, even though he wanted the semi-dramatic part badly), but eventually writer Howard wrote in the new character of Seymour, because Jerry was advised to be the comedic character he played onstage. While the other characters dart about onscreen in IRMA, we know they’re trying for comedy, but they’re using that old theatrical style of acting and punchlines that Martin and Lewis ripped apart in their live shows. Irma is too incognizant and Al is too slimy to be funny. DeFore (the millionaire) is meant to be suave leading man material, but will end up playing B-characters in subsequent Martin and Lewis films. And Jane is too annoying to be anything. You see, Jane is written with that ingrained sexism that was a feature of all movies of this era. Her dream job is to become a secretary – and she only wants this job because her boss (DeFore) is “dreamy”! Then smooth Steve gets under her skin so she starts doubting her resolve to “go for her goals” – her goals being to follow through with a loveless marriage to a rich guy! Jane says to Steve, as he woos her, “I wouldn’t want you to think I was a gold-digger. It’s a question of wanting something and going after it. And if you’re going to marry, it might as well be a somebody instead of a nobody.” Yeh, uh, pretty much the textbook definition of a gold-digger. 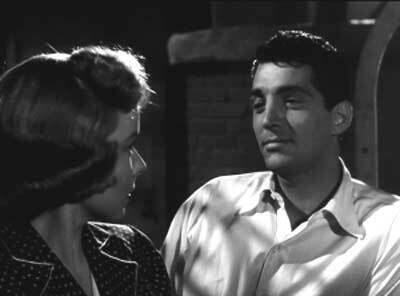 In one scene, Jane cries inconsolably on her bed lamenting, “When I finally hook a millionaire and I’m ready to reel him in, I have to fall in love with a guy who hasn’t even got enough money for rent!” So you are fully cognizant of your plan being devious, devoid of love and purposefully gold-digging?! But why are you weeping so? If you DO value true love over scheming avarice, the choice should be easy – Steve! But you weep in distress because you PREFER the enabled lifestyle that you will have to give up if you choose Steve. In other words, you LOVE being a gold-digger and are wondering how to reconcile yourself to a life of poverty. But then, no one really cares what these two chicks are up to (at least, I don’t); MY FRIEND IRMA is merely an academic exercise in observing the beginnings of the film legacy of Martin and Lewis. No woman can resist the smooth taste of Brylcreem. These old movies: how they gave our parents the wrong impression of courting and love and fidelity. And fashion. Steve says “I love you” to Jane after three days of sleeping on her couch (because he’s penniless, remember), and Jane is portrayed as a “good girl” because she ultimately chooses penniless Steve. Because – true love. And in this age of pointy bras, Jane is so flat that the producers don’t even bother making her wear one (she’s got those chest buds like Hermione in the third HARRY POTTER movie), although we get to gawk at both her and Irma in (vomit) petticoats, where we are surprised to see Irma sporting a bangin’ caboose! Writers: Cy Howard, Parke Levy. Starring: John Lund, Diana Lynn, Don DeFore, Marie Wilson, Dean Martin, Jerry Lewis, Hans Conried, Percy Helton.